Comments Off on We celebrate Agriculture more than once a year! $1.15 billion. That’s what the 450 species of wild pollinators that call New York home contribute to our agricultural economy each year. But we’ve seen alarming declines in pollinators of every stripe and color. Some are bees and wasps. Others are flies and butterflies (and on the night shift, moths). Their loss is worrisome to everyone from rooftop gardeners to farmers with a thousand-plus acres in crops. These people depend on pollinators to grow the foods we eat, foods ranging from pumpkins and pears to blueberries and beans. In fact, anyone with a garden or even planter boxes on their balcony has reason to care about pollinators. And there’s no time like the present to start planning for this year’s pollinator plantings. 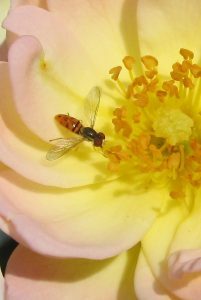 IPM’s mission covers everything from farms and vineyards to backyards and parks, protecting all kinds of non-target plants and animals (even covert pollinators like tiny bees and flies ). That’s why we were invited to help out in 2015 when Governor Cuomo announced an interagency task force, led by the New York State Department of Agriculture and Markets and the Department of Environmental Conservation, to develop and promote the New York State Pollinator Protection Plan, or PPP. In fact, New York is among the first 10 states to officially adopt a PPP. The PPP was released in 2016. And the best thing is, it’s not going to stay on the shelf. This is a living document, a roadmap of sorts to guide IPM researchers and educators, farmers and householders as they plan IPPM—Integrated Pest and Pollinator Management protocols — to keep pollinators healthy for decades to come. We’re pleased to be aboard. Comments Off on It’s Pollinator Week. Read All About It. It’s Pollinator Week. Read All About It. 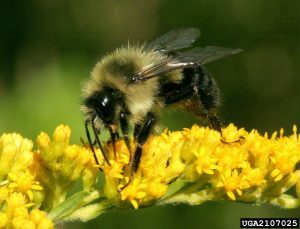 It’s summer; the goldenrods will be blooming soon, with bumble bees buzzing around them. Photo courtesy David Cappaert. When we think about bees, we mostly think about honeybees … a European native brought here by the very first colonists. Now honeybees are struggling, hammered by a constellation of 20-plus diseases and parasites — not to mention a range of insecticides and fungicides. About 450 species of wild bees also populate our fields and gardens. They have similar problems. And they’re losing habitat. This is serious business: we depend on pollinators for at least one-third of our food supply. Altogether, these pollinators boost New York’s economy by $1.2 billion. And consider all those other critters: flower flies and hover flies, wasps, butterflies and moths; even hummingbirds — they are legion, they work hard for their living; they help too. NYSIPM funds educational projects like this. Photo courtesy Jen Stengle. What to do? For starters, we can make all these helpers even more at home in our fields and gardens. Indeed, it’s through bringing together everything IPM knows about host and pest biology and habitat; about pesticides and their EIQs; about habitat protection and biodiversity — these are the things we excel at, and these are what we’re putting into play now to find the answers we need. Ah … answers. Such as? Since protecting non-target organisms is core to IPM, we helped advise the governor’s Pollinator Task Force in crafting a Pollinator Protection Plan — itself informed by a national strategy to promote the health of all pollinators. And our flagship IPM Annual Conference highlighted an IPM problem-solution approach for the 100 participants: farmers, consultants, beekeepers (but of course), landscapers, researchers, policy makers, greenhouse growers, and more. Check it out — not only because you care about your health and your food supply, but because you care about this beautiful world we live in. Comments Off on Earth Day. It’s Every Day. Especially for Farmers. Earth Day. It’s Every Day. Especially for Farmers. For farmers everywhere, but perhaps most of all for organic farmers, every day has to be Earth Day. And since what matters for farmers matters for us all, every day is Earth Day for you, me, everyone. Take farmer Lou Lego. He earned an Excellence in IPM award earlier this year for his inspired, inventive work putting IPM into action at 100-acre Elderberry Farm and Restaurant, midway between Owasco and Skaneateles lakes in New York’s Finger Lakes Region. 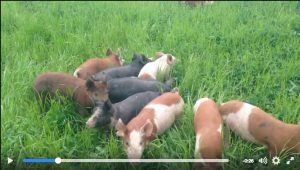 Pigs on pasture cycle carbon by eating and fertilizing grasses which take up carbon dioxide and return it to the ground. Watch the video at Elderberry Farm’s Facebook page. According to Lou, Earth Day means thinking about the future — think of it as the “every day is Earth Day” approach. One day he’s thinking about cover crops or providing for beneficial insects. On another, tillage practices — about rebuilding and nourishing the soil. Yet another, slowing or reversing wind erosion. All good IPM. And always about slowing or reversing climate change. Every year, Lou says (and he’s been at this a while), his soil is richer, better, healthier. Healthier soil means healthier crops. And while healthy crops can’t ensure freedom from every disease and insect pest, still — healthier soils and crops are among the IPM tactics Lou relies on, the better to cope with pests that seem bent on destruction. For Lou, though, dealing with greenhouse gases such as atmospheric carbon — that’s the biggie. Granted, on Elderberry Farm it’s the “a journey of a thousand miles begins with a single step” approach. And it takes a village — no, it takes pretty much all of us — to pull off climate change. What about on Lou’s scale? Sure, healthier soils can help. Tilling right can help. The research is coming in and yes, sustainable agricultural practices (think IPM) have a role to play. 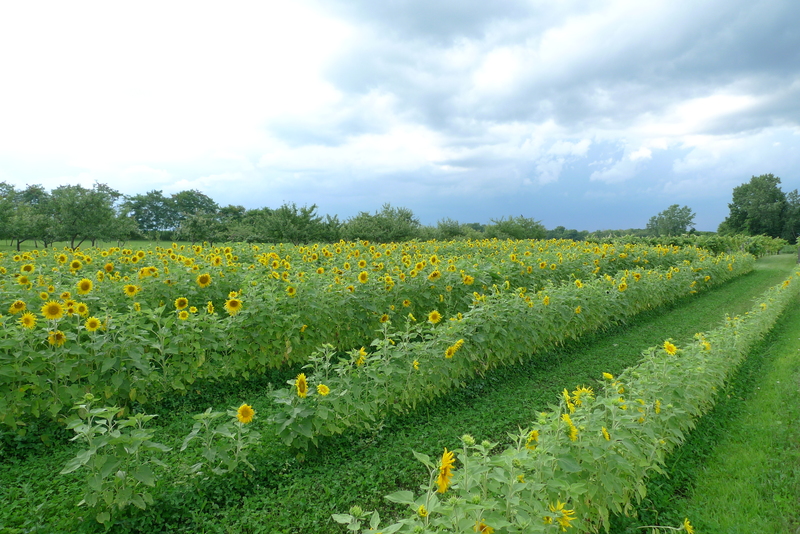 Tall cover crops and sunflowers bordered by trees provide habitat for beneficial insects and wild bees. And growing trees helps. Elderberry Farm’s fields are bounded by hedgerows or orchards, trees whose leaves pull carbon out of the atmosphere. Much stays in twigs and branches, but even more gets stashed in their roots — and they keep it there for the life of the tree and beyond. For Lou Lego — and for IPM too — short term, long term: every day is Earth Day. 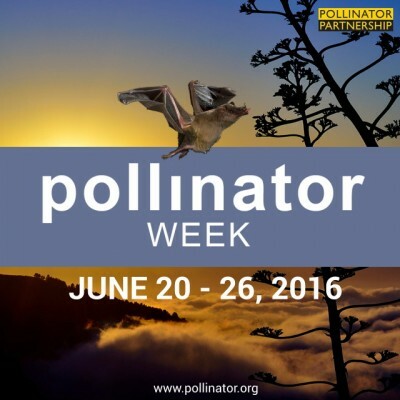 Pollinator week — coming right up on June 20 — celebrates all pollinators. There’s honey bees, of course, but also native bees. 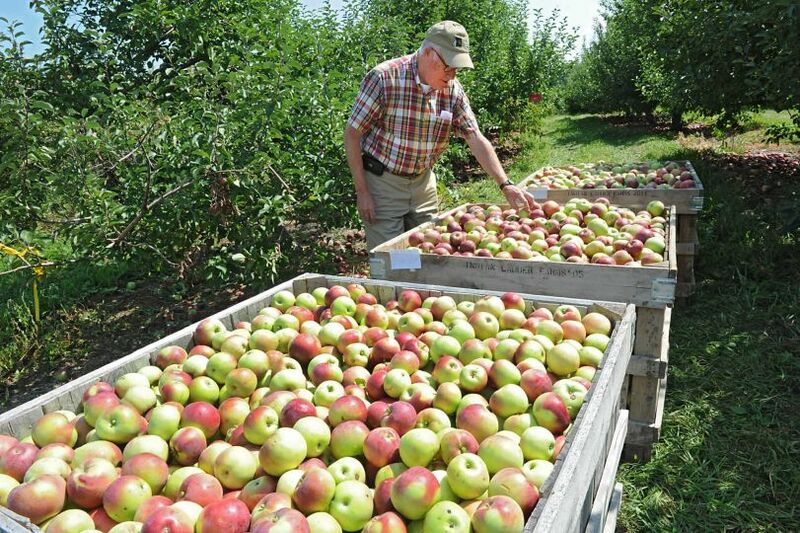 In fact, NYS IPM-funded research has counted 104 known species alone in New York’s orchards. Of course, bees pollinate more than just orchards, and 450 species all told call New York home — including two on New York’s endangered species list. Collectively these bees contribute upward of $9 billion in pollination services to New York’s economy — and we’re not even talking the value of honey itself. Gotta love bats, even if they don’t pollinate flowers in the Northeast, They offer so many other ecosystem services. Mosquito control, for starters. For sure: we can’t leave out butterflies, moths, flies (think flower flies, hover flies, and more), wasps, beetles, and hummingbirds. If we lived in the Southwest, we’d be thanking bats as well. Now, though, let’s focus on bees, since entomologists have discovered so many cool things about how flowers attract bees — and vice versa. Those scientists have found an array of captivating “who’d a thunk it” ways these symbiotic mutualists have evolved to do each other right. Yet before we go down that track, a little detour — pointing you to info from NYS IPM’s “Protecting Pollinators” conference. Start with the first two: Emma Mullen’s fascinating talk and superb visuals, and Scott McArt’s tour of Cornell’s research, now in full swing. OK, back to our symbiotic mutualists — the blossoms and the bees. Examples? Consider color. Bees don’t see red, but they do see ultraviolet. In fact, many flowers equip themselves with “come hither” ultraviolet landing platforms, landing strips, or both. OK, bees don’t see red. 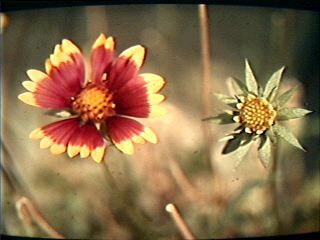 But gaillardia — blanket flower — has a trick up its sleeve. Gaillardia again … with UV guidance to the goods. Why? That electric charge advertises — you guessed it — a nectar source. On the other hand, a blossom just depleted of nectar needs to recharge its nectar reserves. So it emits a different signal, one that alerts the bees to just fly on by. After all, bees can learn. And they don’t have time to waste visiting pretty flowers if the nectar is gone. 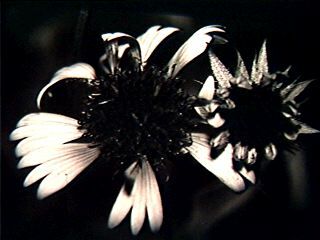 Bees might learn to ignore a flower with a reputation for false advertising (as it were) — even after the flower had topped off its tank. Plant for continuous bloom — pollinators don’t get down time; your garden shouldn’t either. Is your yard tiny? Try collaborating with your neighbors and think of it as yet another form of symbiotic mutualism. Cluster your plants. Groups of long-blooming flowers, rather than single plants scattered here and there, offer bees a better use of their time and energy. What to plant? Variety is the spice of life. Trees and shrubs: oak, cherry, willow, basswood, birch, tulip poplar, crabapple, blueberry, red maple, pine, hawthorn, linden, redbud, arrowwood viburnum, chokecherry, Rhododendron canadense, spicebush, gray dogwood, serviceberry, New Jersey tea, buttonbush, summersweet, Virginia sweetspire, American witchhazel. Perennials for sun: aster, goldenrod, sunflower, Joe Pye weed, violet (also does well in shade), hardy geranium, black-eyed Susan, iris, milkweed, penstemon, phlox, threadleaf coreopsis, bee balm, cardinal flower, mountain mint, purple coneflower, columbine, liatris. Perennials for shade: woodland phlox, blue lobelia, jack-in-the-pulpit, indian pink, wood aster, Dutchman’s breeches, violets (also does well in sun). Weeds: OK, so you don’t need to plant dandelions; they plant themselves. They aren’t native and some people can’t stand them. But they’re here and they provide crucial early-season food for bees. So there you have it. 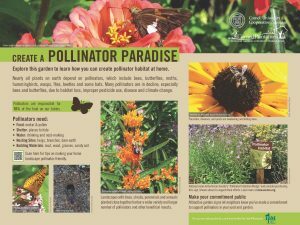 You too can protect pollinators. Each year we seek nominees for our Excellence in IPM awards. We look for people who make a difference, whether on farms, in communities, or at research sites across New York; people who care about human and ecological health and resilience. Sometimes the abundance of stellar candidates amazes us. This was one of those years. Take Peter Ten Eyck. Farmers, legislators, researchers —Ten Eyck is in touch with them all. 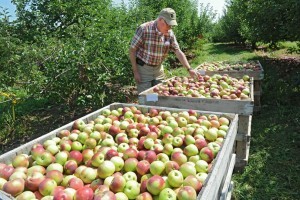 He practices what he preaches at 320-acre Indian Ladder Farm south of Albany, having used IPM protocols for decades on his organic vegetables and berries — and Eco-Apple certification protocols on his main crop, apples. “Legendary.” That’s how Cooperative Extension educator Dan Donahue describes Ten Eyck’s insights and influence at the local, regional, and state level, including twelve years of past service as a Cornell University trustee. “Challenges the status quo,” says Juliet Carroll, fruit coordinator with NYS IPM — citing Ten Eyck’s willingness to take risks to protect the environment from needless pesticides. “Inquisitive; outstanding; stays on top of the research — and a good steward of the land,” says Tom Burr, a Cornell professor of plant pathology, citing Ten Eyck’s influence on others ranging from fellow farmers to state legislators. Check him out.